Bridget (called Birgitta in Sweden) was born the fifth child of Birgir Persson, the governor of Upland, and Ingeborg, daughter of another provincial governor. From this high born position, she seemed destined to play some role in the temporal affairs of Sweden. While she did influence worldly matters, her mission was not limited to Sweden, but, rather, her voice was heard around the Christian world. The first of the many visions she was to have throughout her life came to Bridget at the age of seven, when she saw herself being crowned by Our Lady. At ten, she pictured Christ on the cross telling her that he was made to suffer by those who spurned his love for them. When she was thirteen years old, Bridget married Ulf Gudmarsson, himself only eighteen. Ulf, described as “rich, noble, and wise,” and Bridget had eight children, one of whom is Saint Catherine of Sweden. Early on, the couple became heavily involved in charitable work and brought their children up to maintain a sense of humility and obligation. In 1335, Bridget was named the principal lady-in-waiting to Blanche of Namur, wife of King Magnus II of Sweden. At one point, Bridget took a leave of absence from the royal court to go with her husband on a pilgrimage to Spain. During this trip, Ulf became seriously ill and was not expected to survive. Bridget’s prayers were answered in a vision of Saint Denis who assured her that Ulf would recover. Upon regaining his health, Ulf and Bridget pledged to devote the rest of their lives to God. But before they could fully implement this resolution, Ulf died in the monastery at Alvastra in 1344. After Ulf’s death, Bridget lived at the monastery for four years. While in their married life, she and Ulf had outwardly displayed the clothing and adornments of their rank, Bridget began at this time to dress in the manner of a humble penitent and to practice severe austerities. As the result of another vision, Bridget returned to the court of King Magnus. During this period, the king liberally endowed a convent at Vadstena that would house the Order of the Most Holy Savior, the religious order founded by Bridget. 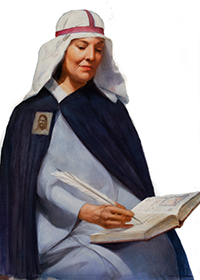 Bridget’s correspondence with popes began as a result of a vision. She wrote a candid letter to Pope Clement VI urging him to bring peace between Edward III of England and Philip IV of France and spelling out the consequences to the kings of a failure to achieve a peace. When the pope’s lukewarm effort fell short, the results which Bridget foretold occurred. Along with Saint Catherine of Siena, Bridget played a part in influencing the return of the papacy from Avignon to Rome. In the year 1350, Bridget went to live in Rome. Here her visions and prophecies concerned the most urgent political and spiritual questions of her time. She spared no one—rulers, popes, priests, or people—in her criticisms when their transgressions and the punishments they would merit came to her in visions. This, of course, did not earn her many friends among those she accused. Before writing or speaking to these offenders however, the saint sought the counsel of her confessors or the pastors of the Church, not trusting, in her humility, her own judgment. In response to another vision, Bridget’s final journey was to the Holy Land in 1371. Her daughter Catherine, her son Charles, and others joined her on this pilgrimage. On this journey, Charles came down with a fever which, after a short illness, killed him. Bridget was devastated, since Charles, along with Catherine, had been a favorite child. Bridget had been ailing for several months prior to her return to Rome in 1373. She continued to waste away until her death in July of that year. Bridget was initially buried in Rome, but some months later, her remains were carried to Sweden by Catherine, and Bridget’s confessor, Peter of Alvastra. She was finally laid to rest in her convent at Vadstena. Saint Bridget was canonized in 1391 and is the patron saint of Sweden. An optional memorial is celebrated in her name on July 23. Bridget's message today: In response to her visions, Bridget criticized some very important people during her lifetime. Not trusting solely to her own judgment, however, she first checked with her confessor or pastor before judging others. When we feel compelled to scold someone, we may not always be so prudent. Have you rushed to judge a family member or someone you know? Perhaps your prayers can have a greater effect on their lives.